This beautifully presented seafront, 2 bedroom, south facing ground floor apartment “ticks all the boxes”. 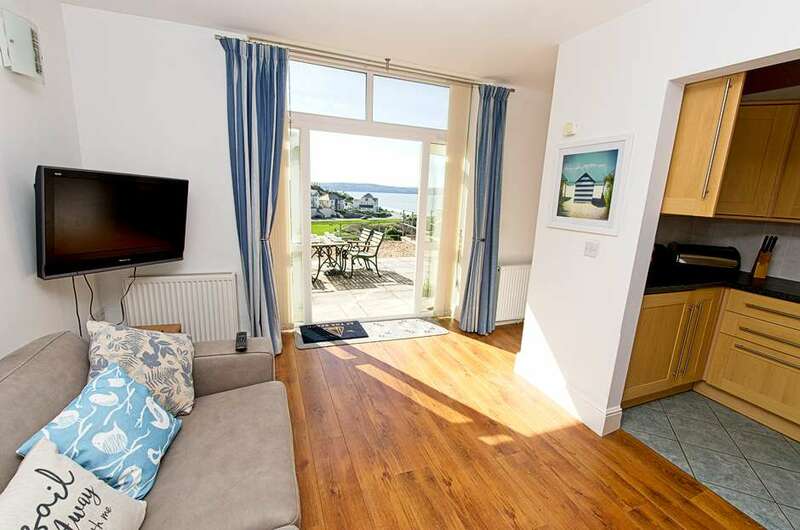 With simple furnishings, bright fresh décor, Wi-Fi, parking and most of all lovely sea views from the living room and front terrace, it makes a great holiday home at any time of the year. Perfectly formed, this great little apartment is all about the outdoor space and fabulous terrace, the largest of all four that we manage at Pebbles Court. Having parked at the rear of the building there are steps and a slope around to the entrance from the sea facing terrace area. This apartment isn’t huge but bijou and nicely appointed for a family holiday by the sea. From the front door there is a corridor running front to back of the apartment from which all the rooms lead off. The living room has double patio doors to the terrace and the view is over Combesgate beach and to the sea and Lundy. The only building in the foreground is the roof tops of The Watersmeet Hotel, an otherwise uninterrupted view. In the living room are a sofa and chairs, foldaway table and folding dining chairs for four people. The kitchen is open to the living room making this a more open plan feel. There is a good size TV and the apartment has unlimited Wi-Fi. In the kitchen area are the usual appliances, washing machine, dishwasher, fridge/freezer, cooker and hob and microwave. It caters for four people with utensils, crockery and cutlery. Along the corridor are the two bedrooms and family bathroom. The master double has double bed, two wardrobes, dressing table, chest of drawers and bedsides and a shower room ensuite with WC and sink. It has a window to the rear. The second bedroom is ideal for children from six years as it has bunk beds. The storage is limited but adequate for children. Again, the window is to the rear and is obscured with a blind as no view. The twin room has exclusive use of the family bathroom with bath, shower over, WC and sink basin. At the front the terrace gets the sun most of the day. There is a table set for outdoor dining and enjoying the views. Bring your faithful friend for just £20! per dog.